Attention Builders and Investors and Anyone who wants to live near the Villages. 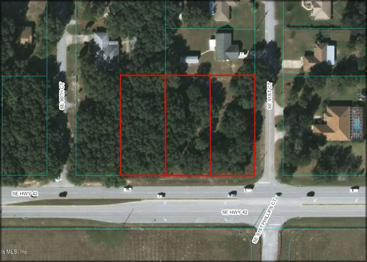 Rare Opportunity 3 lots on Hwy 42 across from the Villages at Sumter Landing. Corner 1.44 Acre with 285 Feet Frontage on 42 and 220 Feet on SE 91st Court. At 4 way intersection with median cut. Part of the Pinehurst Subdivision which is surrounded by booming Orange Blossom Hills. Property across from new developments and commercial property of The Villages across 42. VA Clinic and Publix at Mulberry Square within sight. Survey available. No HOA. These lots are .48 acre each. Build a large house here or 3 small ones or hold for future. Allows extra separate garage buildings as well. Pinehurst has very nice homes poised among all the new houses being constructed in Orange Blossom Hills.